Money is a very fascinating subject for elementary school students as they learn to sort and count it, spend it independently and calculate correct change. If your kids have mastered basic money math skills already, they might enjoy these somewhat more advanced money math problems. Disclosure: I am an Amazon Associate, and this post contains affiliate links. For full disclosure, click here, and thank you for supporting my blog! For your convenience, I pulled the problems above into a Money Math free printable. I am not providing the answers to these problems, since I assume that any adult presenting these problems to children should be able to solve them on his/her own, but if you are in doubt, please ping me in the comments, and I will give you answers. How do you teach your elementary school kids about money? Follow my Math Pinterest board. Check out these ideas from Second Grade Blogging Team! 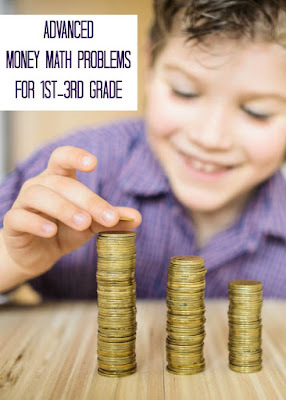 Money Activities for Second Grade from Look! We're Learning! Some fantastic advanced math problems. Great for mastering Money. I always laughed when I taught and kids had to make change using several different ways. I always ended up with several kids drawing out 65 pennies.